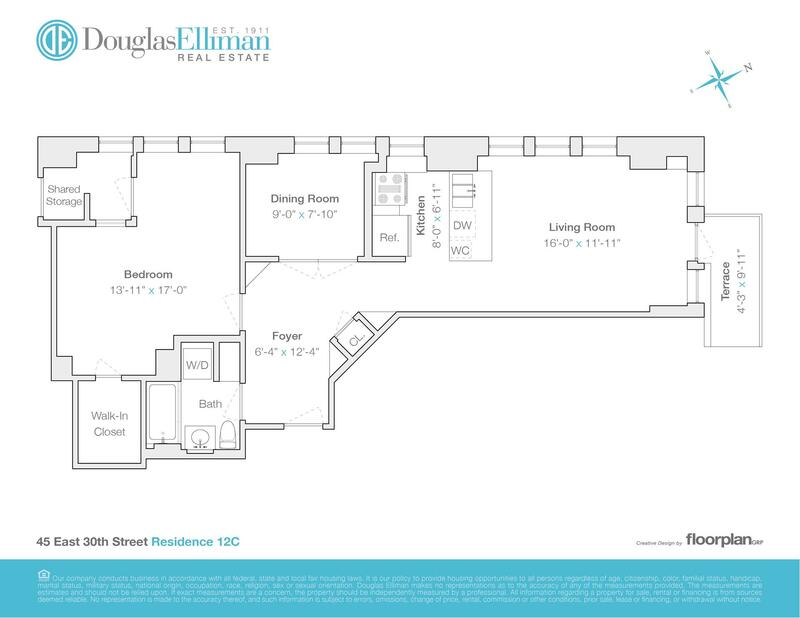 Located steps off of Park Avenue and nearby Madison Square Park, Residence 12C is ideally situated on the southwest corner of the upper portion of Park South Lofts. This pre-war one bedroom plus additional bedroom/den/home office, one bathroom home features industrial deep-set windows filling the entire space with generous light and views of the surrounding NoMad neighborhood, and soaring ceilings approximately 12' high. Upon entering through the foyer, flanked by coat closet and built in shelving, the Brazilian Cherry hardwood floors continue into every room, including the open kitchen and living space. Equipped with Viking gas range, oven, and wine cooler, custom double sink, disk washer, and Giallo Granite countertops, the kitchen provides ample room for cooking, dining, and socializing. From the living room, the balcony offers an additional entertaining area and outdoor retreat. On the opposite end of the apartment, the spacious master bedroom features a walk in closet and ample room for a full suite of furniture. Conveniently located just off of the bedroom, the bathroom is equipped with an Ultra Primo therapy soaking tub, Carrera marble floors, storage, and combination washer/dryer. Park South Lofts amenities include a doorman, video intercom, and private storage for lease. This boutique pre war conversion building is surrounded by some of the best restaurants in New York City, with transportation, parks, hotels, and grocery options just a stone's throw away. There is a monthly assessment in effect in the amount of $145.97 which ends July 2028.